This review is part of my post the Best Road Bike Wheel Upgrade Options. The newest model Zonda C17 introduced in 2017 increases a couple of millimeters to 17mm wide inside (measured between the bead hooks) and about 22.5mm outside (across the brake tracks). Little else about the wheelset has changed. The Zonda still has a box rim profile, steel bearings, and aluminum body hubs, signature 3-spoke groupings around the rear wheel, low profile alloy rims (measured 24.4mm front, 27.2mm rear), middle of the pack weight (measured 1537 grams) and not tubeless. It also still remains a bargain at a market price of about USD$360/£330/€380/AUD$550. The good news for stout riders is that the new, wider Zonda remains a very stiff alloy wheel. My 200lb/90kg (or so) friend and fellow tester Moose reported that it has the best out-of-the-saddle stiffness while climbing of any alloy wheelset he’s ridden. And I call him Moose for both his strength and weight so that’s saying something. For a squirrel like me at 150lbs/68kg who finds many wheels plenty stiff for what I do to them, the Zonda is noticeably stiffer and seems to transfer every last watt I can put out with utmost efficiency. The big question before riding these new Zondas was, would the extra width make them less harsh than the 2016 and earlier models, ones that only a heavier ride could love and for their stiffness rather than their compliance. I mounted them up with 25C Michelin Power Competition tires and at 85 psi front and 90 psi back and found them middle-of-the-pack comfortable. Neither harsh or plush. Moose, who rode them closer to 100psi, felt they rode pretty smoothly on the typical unevenly paved and occasional bumpy roads he normally rides. While they might handle better with 23C tires at 5-10psi higher pressure or be more comfortable on 25C tires with 5-10psi lower pressure, the size, and pressures that Moose and I ran them provided for a great combination of handling and comfort. I also recognize that with all the hype around wider tires, few are going to buy these wider Zondas and put 23C tires on them. That’s ok because they are too shallow to get any real aero benefit out of them, even if the inflated tire width was narrower than the rim width to improve airflow. The hubs are also middle-of-the-pack performers. They certainly aren’t the fastest to accelerate but aren’t slow. They aren’t super quiet but also don’t put out the clickety-clack of louder hubs that some riders love. Overall, reasonably good accelerating, rolling and sounding hubs that aren’t going to set themselves apart from the others for these qualities. In summary, the Zonda C17 addresses one of the biggest issues with stock wheels – lack of stiffness – with a solution that works for riders large and small, the latter thanks to the little bit of added width. Perhaps the best news for Campy and Fulcrum fans (I’m a fan of good wheels, not of brands) is that almost all of the variants of the Campy Shamal and Fulcrum Racing lines have moved to 17C widths over the last couple of model years and I expect the rest likely will. The new, wider Campagnolo Shamal Ultra C17 (price compare here) and twin Fulcrum Racing Zero C17 (price compare here) are the flagship alloy models from Campy, essentially the same wheels and from the same company under different brand names. They are part of lines that include the Campagnolo Zonda C17 /Fulcrum Racing 3 (the latter now also made in the 17C width; see below), which run at half the market price of the Shamal Ultra/Racing Zero, to the Campagnolo Shamal Mille C17 (here)/Fulcrum Racing Zero Nite C17 (here), the models with blacked out brake tracks that sell for even more. These wheelsets all share the same rims and spoke patterns with differences in rim etching, brake treatments, spoke materials, hub shell materials and bearings, freewheel and flange materials. Whether you would notice any performance differences between these wheels or could justify the price difference is for each of you to decide. I, for one, can’t and am just happy to have a decent upgrade option at a great price. I recommended the last, narrower model Zonda as the best alloy upgrade for 175lb/80kg and heavier riders. If you need or want a stiff wheel and budget is your first consideration, the new Zonda C17 should be your first stop for riders of all sizes and my recommendation as the Best Value among alloy upgrade wheels. It also still remains a bargain at a market price of about USD$400/£325. You can use these search results from Know’s Shop to price compare the Zonda C17 at stores I recommend because they have the best prices, customer satisfaction records, and selection on enthusiast-level cycling gear and kit. So considering comfort, stiffness, compliance, and overall quality, how would you rate this against the Bortola? I weigh around 168 lbs. Thanks again for a great review Steve ! I have owned Hyperons & Nucleaons in years past & know Campy wheels are tough & reliable. They are incoming now & should be here in a day or two. I think these represent a really nice deal & look forward to riding them. Thanks again really appreciate your site! Hi Steve. I always appreciate your reviews! I’m looking at Shamal C17 wheelset. Considering they have some similarities with the Zonda, should I expect the same result on the road but with better acceleration and rolling capacity because of better hubs made of ceramic? Claude, ceramic bearings can extend the life of hubs but don’t improve the acceleration of a wheelset. Not sure what you mean by rolling capacity. Ceramic bearings can be made to tighter tolerances and therefore might roll smoother than steel ones but Campy’s steel bearing hubs are well made. What you get with the Shamal Ultra is a marginally lighter but I would suggest indistinguishable weight difference and a little more exclusive wheel. The Shamal Mille gives you the same Zonda and Shamal rim with a blacked out brake track that makes it look like a carbon wheel but gets closer to the price range of what some value priced carbon wheels actually cost. Thanks for the review Steve. Maybe you could clarify why “[w]hile they might handle better with 23C tires at 5-10psi higher pressure”? Andy, It’s a relative statement and probably incompletely phrased on my part (and quoted on yours). 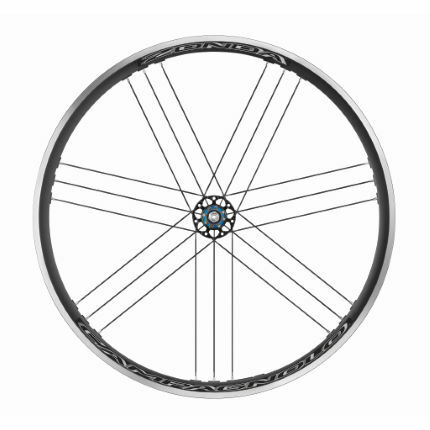 The full explanation on the speed, handling and comfort effects of the combined choice of tire and rim size and pressure is here: http://intheknowcycling.com/2016/04/03/best-wider-road-bike-tires-wheel-sizes/. In brief, you want a more vertical than rounded side wall for best handling, all else being equal. Rounded sidewall (or light bulb) will occur on tire too wide for the rim, especially at lower pressures and create mushy handling. Some go with wider tires in hopes of bigger contact patch for better handling but choice has to consider inside width of rim and tire pressure to maintain sidewall structure. Would love to find something like the Bortola with disk compatibility and tubeless! And the price is amazing! Have you seen http://intheknowcycling.com/2016/02/21/best-wheels-for-disc-brake-road-bikes-2016/? Product is there now even if pricing isn’t. Did you have the chance to try the hadron wheels from swissside? It got my attention, trying to find anyone who owns the wheel or has tested. Really enjoyed your posts – thank you for the insights and clear, informative, and objective reviews. I am very tempted by the Zonda C17 as an upgrade to my stock Giant PR2 wheels but I wonder if spending $200-300 more could get me a substantially better wheelset. Do you think these wheels are as good as some of the pricier options (i.e. in the $500-$700 range)? The price just seems too good (especially with additional discount – thanks!) and I am worried that after purchasing it I’ll feel like I should have spent a bit more for a significantly better set. I get that this is a pretty broad question but hope you can provide some thoughts. I care more about speed than comfort. Thanks again.